Osasu Igbinedion is the founder of the Osasu Show Foundation and the Chief Executive Officer of the TOS TV Network, an online television network which focuses on politics, entertainment and business development in Africa. Osasu Show is aired weekly on AIT, ITV and Ben Television London among others. This daughter of a former governor of Edo State, Chief Lucky Igbinedion, in this interview, speaks on why she chose the media business after she obtained her master’s degree in corporate and organization communication from the North Eastern University, United States. Osasu, also into charity work, speaks on the fate of the Libyan returnees and Internally Displaced Persons (IDPs) in the country. What actually motivated you to go into the media business? I started my media career in March 2015. I studied TV and film production at the New York Film Academy. When I returned to Nigeria, I was involved in political campaigns for some political parties and that was when I realized how good the content was. So I decided to venture into the media. However, the Osasu Show came about after I realised the huge gap between the elite and the masses in the country. The state I met the country when I returned in 2014 was even more deplorable than when I left the country eight years before. So I said to myself that my purpose in life is to uplift the less privileged. Meanwhile, I was making money from political campaigns by branding politicians to be electable. I realized that the reason the less privileged people are what they are today is because of the failure of the leaders and lack of accountability. So I decided I was going to use a vehicle, which became the Osasu Show, to bridge the gap between both classes. And when I visited some IDP camps, I realized that government had neglected these people. I said to myself I will be the one to hold them accountable by starting a television show where people say I harass politicians until they answer my questions. I like holding leaders accountable. We are going to be three years in March; we have interviewed the President, the Senate President, many state governors, Ministers among others. The most fulfilling part is actually the work we have been able to do in the lives of women and children through the foundation. If you watch the Osasu Show, most times, you see the charity work that we do. So the lives we have been able to impact is what is most meaningful to me. What we actually want to achieve is a more equitable society; in the sense that Nigerians should know that there is no office of the President without the office of the citizen. We elect our leaders, we are the government and, until we take power back in our own hands, we can really not accomplish anything. For instance, there is a programme a colleague of mine and I just started, ‘The People’s Candidate’, which avails Nigerians the opportunity to elect who they want as the presidential candidates of the various political parties. This means that instead of the race in 2019 being Buhari VS Atiku for instance, Nigerians can say ‘no, this is the candidate we want’. Nigerians can tell the PDP or the APC that ‘you better adopt this candidate or we will not vote for you’. So we want to revolutionize the system and tell our leaders ‘no more imposition of candidates’. The days of a few leaders sitting down to decide the lives of over 180 million Nigerians are over. Only about 60 million are registered voters and, in the last elections, only 28million came out. So we are saying that even if only 28million Nigerians came out to vote, let those 28million determine who they want as their president. Were you motivated due because your dad is a politician? I think my dad’s tenure in government shaped my perspective in politics. It revealed to me that the collective voice of the people can make change. I was younger when my dad was governor. I was still in school then; so most of his policies I was not able to digest as of that time. But coming out of government, there were certain criticisms about his government and those people who adore him have positive things to say about him too. But I was able to draw from both two perspectives to say ‘this is where you did something good and this is where you failed’. And if, for example, tomorrow I decide to vie for political office, I will pull from that because my dad is the closest politician I have ever met. I will pull from his mistakes and strengths and see how I can shape my political career to scale hurdles. When he was the Chairman of Oredo Local Government Area, the impact he made must have given him the opportunity to run for the governorship the first time. He lost, vied again and won. He did two terms as governor; no one is perfect, he was able to do some work but also faced some challenges. As a whole I was able to pick a few lessons from his actions in office. Being a daughter of a former governor, what challenges have you faced since you started this show? We started from a bad side, now we have graduated to the good side. When we started, people said, ‘Ah, another Igbinedion has come again; why are you lambasting the government that they are not taking care of IDPs? What did your father do when he was governor of Edo State?’ (Laughter). So they were a lot of criticisms. But when people started watching the show, they saw who Osasu was, not just Igbinedion’s daughter. People became attracted to my show. It is a product of passion. If it was just a hobby, I would have quit long time ago. Businesses don’t make money for the first three years not to talk of a political show on TV that airs only once a week. So when people saw that it was more than a pet project, they started taking us seriously. If you go online and read the comments and blogs that posted articles about us in 2015, you will read so many ill comments. But when you read the comments made in 2017, if you read one ill comment, you will see ten positive comments countering those comments. And I don’t know these people commenting but these are people who are now appreciating the show. You have been into charity works. How has it been and what is your take on the number of Libyan returnees we have seen so far? Most of them are from Edo, your state. Government needs to set up an orderly system where those who have been displaced from Borno, you have their names, date of birth and where they stay. Because these are displaced people who will one day go back to their communities. But government, as we speak, cannot track some of them. The IDP camp in Duromi, Area One in Abuja, the Osasu Show Foundation built shack houses for them. We built a makeshift school for them; some other foundations have gone there to upgrade what we did. But as private individuals, how much can we do? Government needs to set up an organized system to take care of these people, empower them. We do that, we train some of the women and they appreciate these things. Right now, NEMA or SEMA cannot tell me they have organized plans for these people in the IDP camps and it is not right. When these people tell you their horrific stories, young children had to watch their parents killed in front of them. Some were in the bush for days drinking their own urine and eating leaves. These are small children, how do you expect those children to grow up and be normal if we don’t take care of them? Nigeria is sitting on a time-bomb because if the next generation of supposed leaders that we are breeding are victims of terrorism, slavery, victims of impunity, victims of bad governance, then we are in trouble. These IDPs need to speak with professionals to help them overcome the trauma they experienced. Provide basic amenities for them and settle them back to their communities so they can live a life worth living. And the Libya issue is one very dear to my heart and it is sad that 80 per cent of the returnees are from Edo. But I am happy Governor Obaseki is finding solution to the problem. Then I look back to my father’s regime and my mother’s work that she did 17 years ago, when I talked to some people and tell them my mum battled this issue 17 years ago, they scream. Human trafficking is older than I am, older than most people. So it is a trade that has been covered up with so much deceit because of how profitable it is. And that is the reason why when you come out sincerity to fight them, they blackmail you and try to destroy you like they tried with my mother but they failed. This is not just affecting us locally but also worldwide. I think NGOs who specialize in anti-human trafficking should all come together and fight this scourge. We should not leave it to NAPTIP alone, because only NAPTIP cannot fund the fight or even take care of the returnees. We must have a strategic plan on how to rehabilitate the returnees, people are doing pockets of good work everywhere but it must be coordinated so that the impact can be felt. The federal, state and local governments need to synchronize their system. The Federal Government should provide the funds while the state governments concerned should crack down on the pimps, the madams perpetrating this crime. And most people think this is a very low level crime but millions of dollars are made. Before these people leave Nigeria, they pay up to N1.5million each, who is getting that money? Imagine getting N1.5million or N1million from 2,000 people every month. We are making billionaires out of this heinous crime. 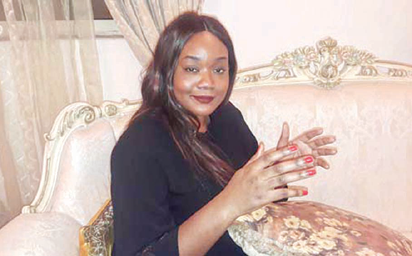 The post I was attacked over TV show for being a former governor’s daughter – Osasu Igbinedion appeared first on Vanguard News.